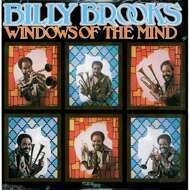 Known previously for his tenure behind R&B legend Ray Charles, trumpeter Billy Brooks proved himself an uncommonly skilled practitioner of jazz-funk with his solo debut Windows of the Mind. "Forty Days" (later sampled to potent effect by A Tribe Called Quest) remains a textbook example of the form, combining Brooks' sun-kissed lead performance with a jigsaw rhythm that's as persuasive as they come. The entire LP is a fecund source for killer breaks and samples, but simply dismantling this music for spare parts is a disservice to artist and listener alike -- Brooks is a gifted composer with a knack for melody as well as groove..!